Just watched the mid-season premiere. I liked it a lot! So many good things. At least for me. I still see no sign of Ezra turning evil. He's showing more and more heart and values. Saw Gerrera on the other hand is scary. You don't want to be in his way no matter what side you're on. And OMG Kanan is powerful I like it! Go Kanan, I love you! Sorry *cough* I am getting carried away. Had to laugh at Rex saying "Yeah, but he's no Skywalker" and Kanan replying "I heard that". So Sabine seems to be a Skywalker, she does not like sand because it gets everywhere And Sabine-fans will love her shining through some kick-a** moment. Hera did at least get to show her piloting skills. Still hoping to see her kick some a** though. Saw's eyes are still green here....I wonder if the poison used to kill/sterilize the Geonisians not only damaged Saw's lungs but also changed hsi eye color? Ezra really has heart! I really don't want him to turn to the dark side....would rather he left the jedi order or maybe just left the rebellion because he was disillusioned with their ways....that would be a good way to explain his departure at the time of ANH. Sabine's jetpack returns.. I can't wait to see her episodes with the darksaber....Zeb seems to have taken more of a backseat and Hera also seems to be coming into her own....I think a confrontation between Thrawn and Hera is inevitable. 1. The Geonosian queen who hatches from the egg in the episode suffers a tragic fate in canon....she is sterile so creates a hybrid of geonosians and droids from an old droid-making unit left on the planet as her children (she fuses the droid making unit to her body).....unfortunately, Vader lands up and cuts off this unit from her, taking it away to create a private army for himself...though the queen survives, this act ends any hope of the geonosians surviving in any form. 2. 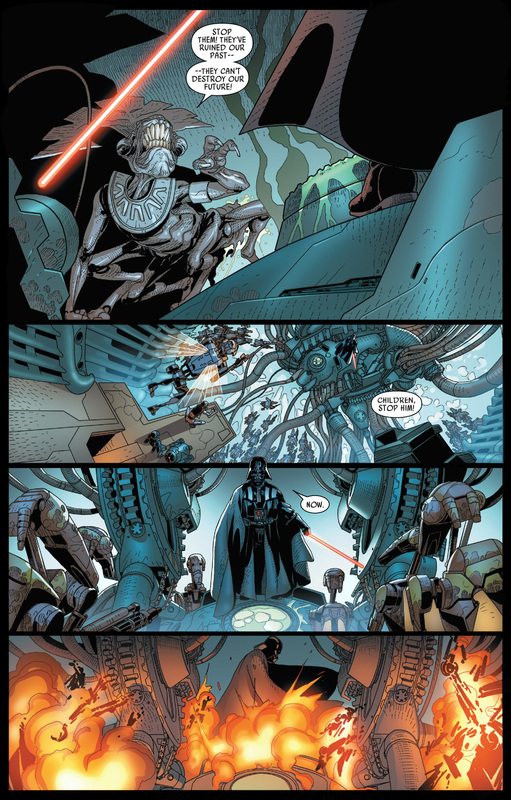 The final confrontation between Maul and Kenobi was written in a legends comic called 'Old Wounds'....I found an uploaded version of the comic and thought it might be an interesting read....in this version, Kenobi almost kills Maul and almost turns to the dark side....fortunately Owen Lars shoots Maul in the head, finally killing him. I've heard people on Youtube speculating that something similar could still happen but instead of Lars Owen, it could be Ezra or Kanan who kills Maul instead to help Kenobi...this is the most plausible scenario. I hope this doesn't happen because Vos has yellow eyes and pale skin in the drawing...does it mean he has become an inquisitor? I don't follow Rebels closely, however I know the characters and I watched the last season's final showdown between Ahsoka and Vader. Even before all rumors on convorees - I had a head canon that Ahsoka actually survived the duel in a body of a convor. If not, I still do think that the convor at the end was not there without a reason. Saw was a lot more intense than I expected. I thought they would start a little more subtle and build towards that kind of intensity, so I can't hardly imagine how much worse he'll get haha. Ezra definitely seems to be moving farther and farther away from the dark side danger zone, especially when Saw is there as a contrast. I was so happy when Sabine went out there with her jet pack. I was waiting for that the whole time the guys were trying to fight the rocketroopers without her. I also loved the comments connecting to the prequels/clone wars "stupid sand, it gets everywhere" and "he's no Skywalker" were great lol. Click Clack was definitely the cutest/most sympathetic Genosian I've seen. It's sad to hear what happens later in the comics :( @panki. @SanghaRen Pablo said check the credits to see if it is Rae Sloane, and unfortunately, it's not. Her name is Captain Brunson. I've seen other sources confirm this when I searched on Twitter for others talking about it and the other imperials were calling her Captian, so I'm pretty sure the Captian Brunson credit is hers. And I couldn't find Rae's name in the credits. :( I really wanted it to be Rae Sloane, as well. At least, it's still good they're expanding the diversity of Star Wars and the empire, I think. Rather than reusing the same character, they're expanding the empire. It makes the galaxy feel bigger to have more women of color in even the side character roles that usually just get filled with white men. I still hope they could fit Rae Sloane into the show sometime. I haven't read all of A New Dawn yet, (that has her, Kanan, and Hera in it right?) So idk how her relationship to Hera and Kanan would look moving into the show, but I'm guessing it could be awesome. @Darth_Awakened wrote: I don't follow Rebels closely, however I know the characters and I watched the last season's final showdown between Ahsoka and Vader. @jakkusun wrote: I still hope they could fit Rae Sloane into the show sometime. I haven't read all of A New Dawn yet, (that has her, Kanan, and Hera in it right?) So idk how her relationship to Hera and Kanan would look moving into the show, but I'm guessing it could be awesome. 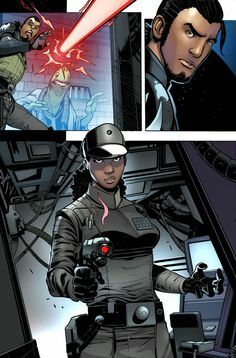 Rae Sloane and Kanan seem to have an ongoing rivalry and they clash both in A New Dawn and subsequently in the Kanan comic series.....so it would be awesome if she lands up in Rebels. So what if Ahsoka is on Anch To with Luke as a convor? @Darth_Awakened wrote: So what if Ahsoka is on Anch To with Luke as a convor? Yes, New Dawn has Rae Sloane in it. I really like her character. She's a dark greyish character. Would not hesitate to blast off a village but not out of villainy. She believes in order and does have a certain code of conduct. She's respected by her crew. I actually could see her switch sides if they want her to. Well if Ashoka ends up in VIII, it will either have to be a bonus or be explained at length. I don't see the second option happening. She's famous in the fandom but not in the GA. If you show people a picture, they might say "I think I saw her somewhere" but I doubt they know who she is. Actually I know for sure all my GA friends and relatives have no idea who she is. Even I know about her since a few months only. So it would be tricky but not impossible. Luke could call the convor Ashoka and Rey would ask who she is and he could explain it very briefly "a former Jedi who knew my father". The question is would it be Ashoka at 100% or just a messenger? I'd prefer a messenger. Or the remains of her spirit so not a full Ashoka but what remained when she "died" or became one with the Force. And this remains of her spirit would have a mission. Maybe there's a terminology in SW for what I am trying to describe. It could be beautiful if well done. I know .....checked the end credits after reading PH's tweet....I think her name is Captain Brunson....maybe we'll see more of her as well though I'm not as attached to her character as I am to Rae Sloane. b. If they plan an Ahsoka movie for 2020, then Luke will definitely mention Anakin's lost padawan to start the wheels rolling for a standalone movie....planting curiosity in the GA's mind. I personally really want an Ahsoka movie because it would explain Anakin's rage against the jedi order ad make him seem less whiny.....Yoda and Obi-wan foist a padawan on him against his wishes, he and Padme get attached to her, then Mace and the council blame her for the bombings and allow the republic to arrest her and almost execute her.....she runs away despite Anakin asking her not to.....he works really hard to clear her name.....she is offered knighthood but no apology from the stupid council....she is disillusioned and walks away and the council don't allow him to become a jedi master despite spending time and effort training Ahsoka....no wonder he felt hurt by Ahsoka and so much anger against the jedi order, particularly Mace.....I think this explanation is very important to improve Anakin's story in the GA's eyes. I think your 2 options are valid. Now we're all expecting a spiritual guide convor and we will get a cute Ewok-like puffin. I don't know if the GA has a bad opinion of Anakin, do they? Somehow I have the feeling most people accepted his story without thinking too much about it. I dislike Anakin But I only watched a couple of Clone Wars episodes and I actually did not like Ashoka in it neither - she was young in those episodes. I like her in Rebels though. And I am waiting for the novel to be available in Kindle to buy it. In the end the worse ones are the Jedi Council. If Luke went the same way and started reciting Jedi Council rules, no wonder Kylo walked away and wants to avenge his grandpa. I'd do the same. I so agree with you regarding Ahsoka in CW, particularly in the early episodes...but there was some unfinished art and animation of her life after leaving the jedi order....her living on Coruscant, dating Nix, going on secret missions for the jedi and most interesting of all- discovering Palpatine's ancient shrine under the jedi temple and getting struck by force lightning.....I mean, even if they don't make a movie of it, I'd settle for seeing it on a TV show. But you are right- Ahsoka in Rebels is so much better....if they so make a movie, maybe they could show instances of her life from childhood till the Malachor confrontation/convor transformation....maybe they will finally show us what exactly happened to her during the finale of season2. I don't think the GA hate Anakin per se....but I have heard a lot of people call him whiny and while they take his sudden outburst and turning into Vader for granted, it is technically still a loose end in the story and there is a disconnect between Anakin of the PT and Vader of the OT...I just think some explanation for his behavior would go a long way to improve the PT....at least he would be a wronged and misunderstood person, not an "I hate sand" brat as he is seen as right now. I also want HC to get the opportunity to play Anakin with another director. 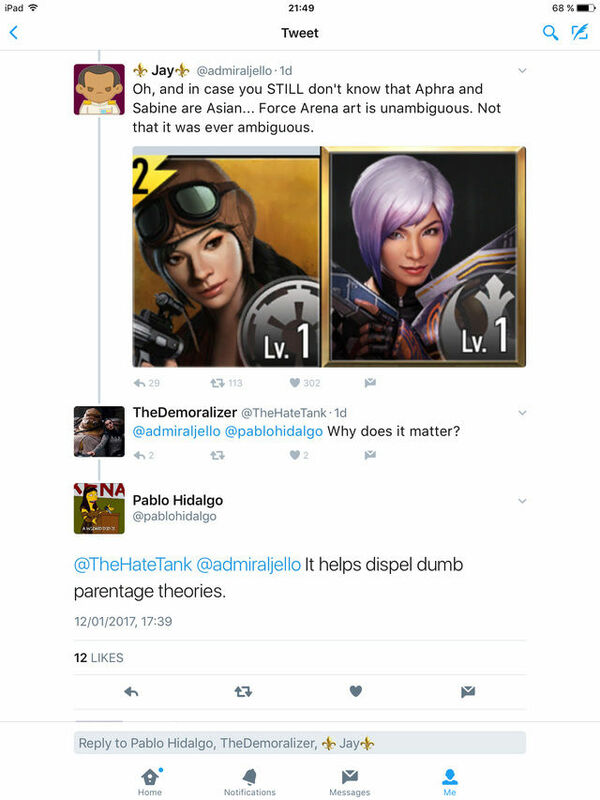 Call me stupid, but I never paid attention to Sabine being Asian-like. Aphra too. And Pablo chimed in. Tactfully as usual Probably I did not pay attention because I haven't thought about their parentage (yet?) Force Arena is free in the App Store. Something to check out. @SanghaRen wrote: Call me stupid, but I never paid attention to Sabine being Asian-like. Aphra too. And Pablo chimed in. Tactfully as usual Probably I did not pay attention because I haven't thought about their parentage (yet?) Force Arena is free in the App Store. Something to check out. I'm not surprised by this....Sabine has been brought up as a potential mother for Rey so maybe they want to dispel that.....I always thought Sabine was South Asian because she is voiced by Tiya Sircar and animated characters sometimes resemble the voice actors (and being South Asian, I liked the idea as well)......but East Asian also makes sense. They forgot to add Carise Sindian to this list as well. Btw someone asked about cameo appearances in future SW films. Of course, he does not answer it. Carise Sindian is a character from the novel Bloodline....doubt she will appear in playing cards....seems more likely to appear in a comic or another novel. The preview of the next episode has got me really excited.....we finally learn about the history of darksaber.....and its creator, an ancient mandalorian jedi named Tar Vizsla, who sounds like a mix of two legends characters- Tor Vizsla and Dorjander Kace.....bringing some interesting implications regarding Kylo for episode 8.....I've to read my old KOTOR comics to give more information. Update: The comic series I read is really interesting... there are two important protagonists in the story- one is a jedi (who was falsely accused of murdering his fellow padawans in the past) and the other is a non-FS from a famous family (his mother is a senator and his father is a very successful businessman)....it is about a group being captured and fighting the enemy from within by pretening to join them, sometimes being forced to kill as well....it also has a part about the kidnapping and indoctrination of jedi padawans.... the end made me a bit sad because the non-FS lives in his family's shadow and is considered the family screw-up....one of the last panels shows him being honored by the republic and receiving a medal from his senator mother. Also, the jedi working undercover secretly contacts a trusted friend, an alien who owns a bar....and this character knows what is really going on.....Maz? Lady Carise. Of course. 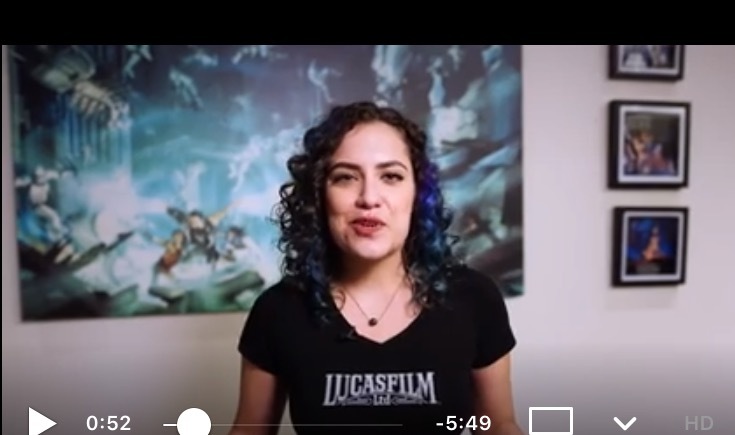 I was confused because I never remember her full name and only call her Lady Carise and Force Arena seems to focus on characters from the OT period. So I thought maybe there was another Carise in that period. @panki wrote: The preview of the next episode has got me really excited.....we finally learn about the history of darksaber.....and its creator, an ancient mandalorian jedi named Tar Vizsla, who sounds like a mix of two legends characters- Tor Vizsla and Dorjander Kace.....bringing some interesting implications regarding Kylo for episode 8.....I've to read my old KOTOR comics to give more information. I loved the animation style of the story of the darksaber at we saw in the preview. And a mandolorian Jedi!? So cool. On another note, I loved the Ralph McQuarrie inspired design of he infiltrator droid in the warhead episode. And it did look a lot like K2 as well. Loved the episode....even the design of the infiltrator droid was awesome....and the way it went around killing droids and acquiring parts for itself was done in a super creepy manner.....was it by imagination or did the droids finger attachments resemble the riot control weapon on TR-8R in episode 7? As for Mandalorian jedi, I wonder if there is some link to Snoke and the KOR? I agree! 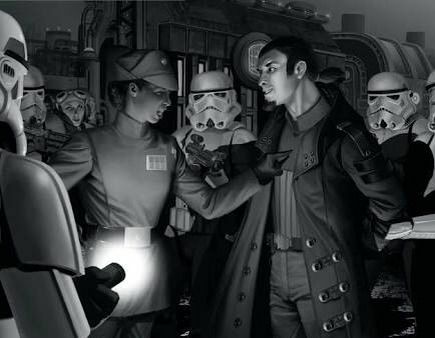 They are a fascinating people/culture in the SW universe. I'm hoping they will be brought into the sagas. If not, I'm also satisfied with CW and Rebels. Pablo and Filoni have done them justice in the EU. Is that a Mythosaur? 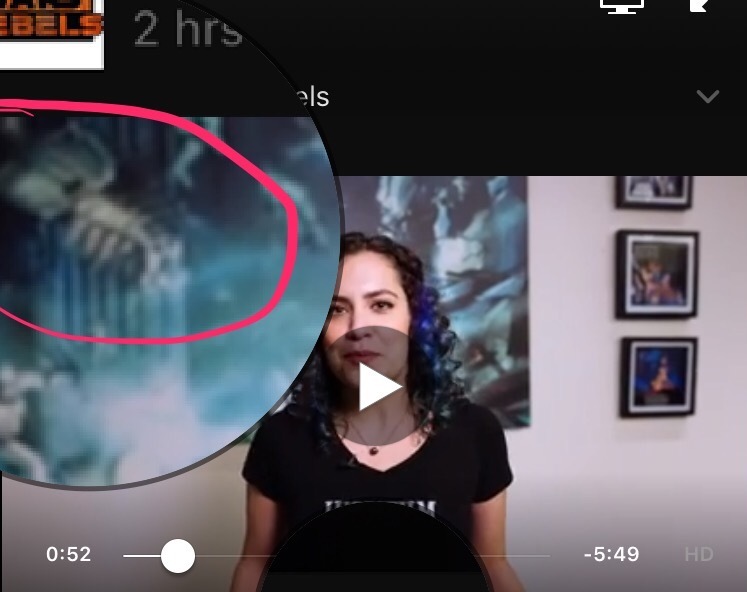 Is this proof that the mythic Mando dragon will make its canon appearance in SW Rebels this season? 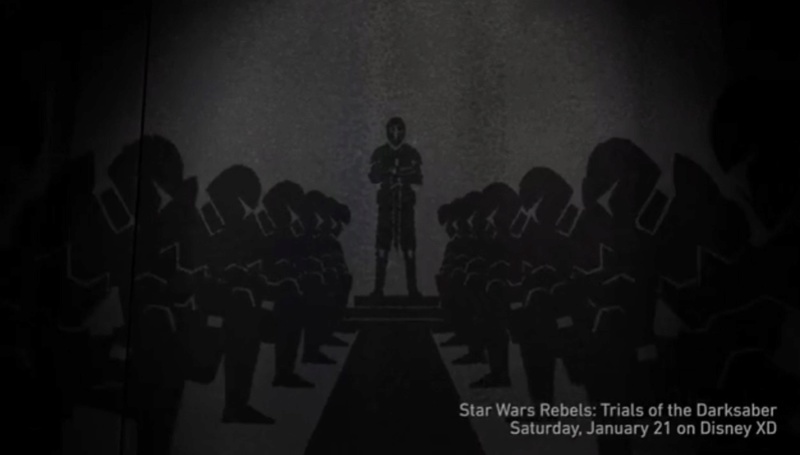 In the Rebels Recon episode for "Trials of the Dark Saber" the host is standing front of a large piece of concept art. It looks as if there are a bunch of Mandos in a cavern setting with a dragon like creature to the left. Sorry, it's not a spoiler, but it made me laugh. I just love Pablo's answer. I must say, I never stopped to think about it. I don't think she's shown any interest in men or women so far. 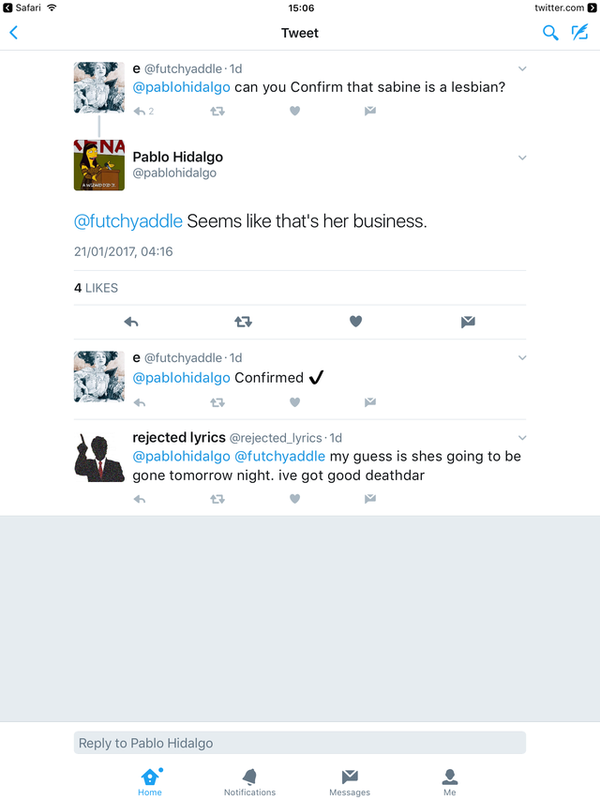 Funny that the poster believes that PH not answering means it's confirmed. Maybe she can be whatever because it's just not important to the story?